Home>Blog > Educational>Get to Know Your Credit Score! 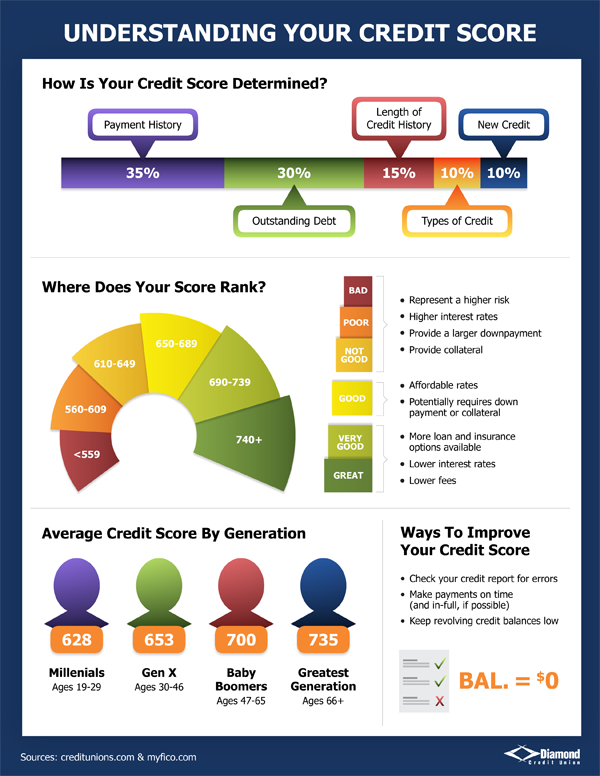 Get to Know Your Credit Score! Almost all of the advice we give our members about obtaining a loan starts with the same first step: Know your credit score! Whether you’re buying a new home, applying for a credit card, or even applying for an insurance policy, your credit score is going to play a big role in the approval process. Your credit score lets lenders know whether you are financially responsible or whether you are a credit risk. The three main credit reporting bureaus – Equifax, Experian and TransUnion – gather information on your financial history and compile it into a FICO credit score. (FICO is the software used to measure your consumer credit risk). Everyone is able to obtain their updated credit report, for free, once per year. Payment History – Do you have a history of repaying your credit card bills or installment loans on-time? If you have missed payments, how many do you have, what was the amount of the missed payment, and how recently did they happen? Do you have a history of bankruptcy or foreclosures? Amounts Owed – How much of your available credit is being used? Are you carrying a high balance on your credit cards? How much of an installment loan, like a car loan, is still owed? Length of Credit History – Do you have a long history of responsible finances or are you just starting out? Types of Credit – Do you have both installment loans and revolving credit? How many credit accounts do you carry? New Credit – Did you open a lot of new accounts recently? Have there been a lot of inquiries from potential lenders in a short amount of time? How Does My Credit Score Affect My Loans? Very simply, a better credit score is going to open up more favorable lending opportunities because lenders understand that you will repay on-time. A lower score puts lenders on alert that there is a higher risk of missed payments or default if they lend to you. When your credit score is in the Good to Great rating, you’ll be charged lower interest rates and lower fees, and have more favorable repayment terms. If you have a Not Good to Poor rating, your loan options are not as favorable. You’ll be charged higher interest rates and higher fees. In addition, you may be required to pay a larger down payment or offer up collateral on your loan. Great news! Just because you had poor credit at one time, does not mean you are permanently marked as a credit risk. There is plenty of opportunity to improve you credit score. 1. Check your credit report for errors. A mistyped social security number, applying for credit under a formal name and nickname (Andrew vs Andy) or other clerical errors can easily add incorrect information onto your report, dragging down your score a result. 2. Make payments on time. If you use your credit unions’ online banking program, set up bill pay reminders, or set-up automatic payments to ensure bills are paid on time, every time. 3. Reduce the amount of debt you owe. Focus on the debt that carries the highest interest rate and put any extra funds to those payments each month. At the same time, continue making at least minimum monthly payments on any other accounts. If you’re a Diamond member, you can also take advantage of our Loan Health Check-Up program to get a clear picture of how healthy your lending profile is. A Loan Health Check-Up includes a full credit report, a review of current and prospective loans, and ensures you have the best loan rates and terms available to you.